If you want to simplify your documentation and avoid using complex tools like Visio, Dia, or Inkscape for displaying charts and diagrams, Mermaid  might be just right for you. Mermaid follows the minimalist concept of Markdown and AsciiDoc formats. This approach opens the door to automated document generation and website integration. The Mermaid project is still relatively unpolished. As you'll learn in this article, the local version has some issues that make it hard to depend on for real production work, but you can use the online Mermaid Live Editor at the project website  to generate diagrams and explore the Mermaid command syntax. The Mermaid project is developed and maintained by Scandinavian Knut Sveidqvist and is licensed under the MIT license. The development is a community effort anchored by the project page on GitHub . Figure 1: Mermaid only needs a few instructions to create a simple diagram for moving your home. Mermaid is based on the Markdown text formatting language, but it goes one step further and transfers the Markdown concept to flow, sequence, and Gantt diagrams. The Mermaid syntax is more economical than Graphviz without compromising functionality. As Listing 1 shows, you can use simple instructions to describe each element in a diagram. You need to terminate each line of the description with a semicolon, but the interpreter is forgiving in case of errors. After declaring the diagram type, the individual nodes and the edges follow; the edges are the references that show how the nodes relate to each other and what they look like. Additional text and brackets define the basic representation of the nodes, edges, and labels. With the help of Cascading Style Sheets (CSS), you can then put the finishing touches on the image; Mermaid comes with three pre-built templates. Mermaid offers a visualization feature for graphs or trees, sequences, Gantt and class diagrams, and Git graphs. Each chart is introduced with a keyword, such as graph, sequenceDiagram, or gantt. For a graph, you also need to specify the reading direction. TD stands for "top down," TB for "top bottom," and BT for "bottom top." RL means "right left," and LR means "left right" (from left to right). 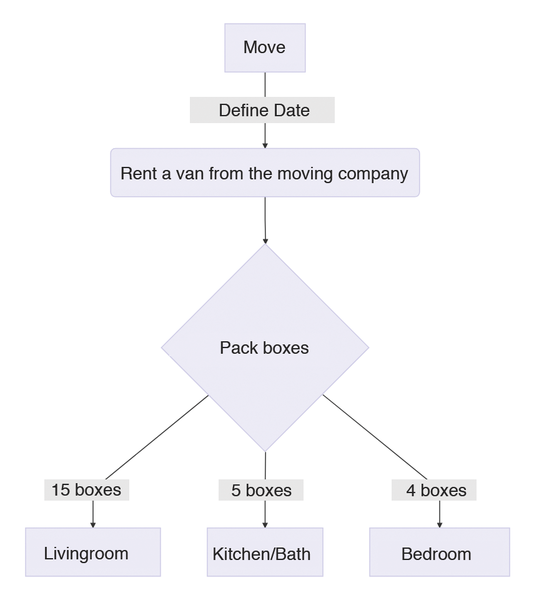 Listing 1 describes a graph for a home moving project that you read from top to bottom and that thus has a TD label. The following examples show how you can use Mermaid to implement various graphical images. All images are taken from the Live Editor on the project's website. Enter the description in the text field on the left, and the tool generates an image in real time on the right. To use this image in other documents, you can download it as a file in SVG format or take a screenshot of the image. Figure 2 shows a graph for possible routes from the German city Magdeburg to Dresden. You can read this graph from left to right (LR). Figure 2: A route generated as a flowchart with Mermaid. You need to consider several factors when formulating a graph. For example, an edge with an arrowhead has the form --> for the normal line width, ==> produces a thicker line, and -.- produces a dotted line. You do not need to add any spaces between the node text and the beginning or the end of the edge, but spaces do make the description more legible. Enclose the description text for the edge either in pipe characters (Berlin --> | A 13 | Dresden) or write it directly into the edge (Berlin --> A 13 Dresden). Node identifiers with special characters need to be in quotes. If you enter an identifier in the form D[living room], Mermaid remembers the abbreviation (D in this case), which you can then use as a reference later on. The type of parentheses determines how the node is displayed: Square brackets create rectangles, curly brackets create rhombuses, and round brackets create rectangles with rounded corners. Build complex data structures into simple but illuminating diagrams using the yEd graph editor.